We deliver Birthday Cakes to your home in Bangkok and Thailand. Birthdays are anniversaries to be celebrated. We make many different cakes for children, young people, adults and the elderly. You can even come up with an idea or you can hear ours - we will do our best to find a cake that meets your wishes for Birthday. We deliver Birthday Cakes to your home in Bangkok. Some of our Birthday Cakes can be delivered throughout Thailand. Please contact us for more info. Tiramisu Cake 2 - 1.5 pound - Servings 6 persons. 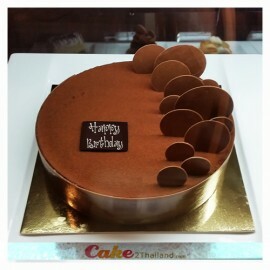 Tiramisu Cake 2 is a Special recipe from Cake 2 Thailand ® Presented in a beautiful gift box. Sure to be impressed. Free delivery in Bangkok and surrounding area. Same day delivery now available. Place your order by 6pm. (US Time Zone) or 12pm..